Two baby playing on the green grass. The dark-skinned and light-skinned boys fool around on the lawn. 비누 거품과 함께 공원에서 노는 두 살 아기 소년. 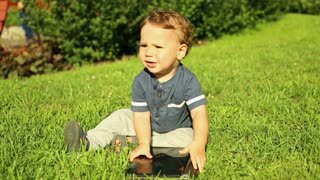 Cute baby boy playing outdoor squatting at the park near to the green grass and looking around. Babe sit on the grass. Little boy playing on the lawn. Black boy fooling around in the field. Children playing at sunset.